Nominated for Best Foreign Language Film (Denmark). Sometimes kids lie, and if we operate under the notion that they are forever truthful, a lot of bad and evil can happen because of it. What starts out as a simple character study of a decent man who has recently been divorced but sees things start to come around, suddenly becomes a terrifying exploration of human nature and an interesting glimpse into a side of an issue we rarely take time to consider. Lucas (Mads Mikkelsen) is currently working at a daycare. He is excellent with the kids and has a very sweet relationship with his best friend’s daughter Klara (Annika Wedderkopp). He hangs out with the children’s parents at night and goes hunting on the weekends. His friends all worry about him, being lonely in his house, but the custody battle for his son seems to be going positively. Suddenly, however, a crush gone wrong leads Klara to tell a lie that could end Lucas’ life… pretty literally. Klara tells the daycare owner that Lucas exposed himself to her, and you can imagine that the story and accusations gain momentum from there. We as the audience are pretty sure from the beginning that Lucas is innocent and we know what damage this can do, but Klara is a young girl who doesn’t understand the power of this kind of lie. We watch as slowly, the whole town seems to turn against him. The people who are on his side are impressive displays of unconditional love but they also trust in the knowledge that Lucas is who they think he is. Klara’s father grapples with a host of intense emotions–the protective nature of a father and the disbelief that his best friend is that kind of man. Mikkelsen is, without a doubt, the driving force behind the success of this film. He won best actor at Cannes Film Festival. His character slinks through the next weeks and months, having not been charged because of a lack of evidence, but is refused business and common decency from the community around him. The film at its core explores the nature of “false guilt.” He is treated as more than a criminal. He receives threats, is beaten, and even church members don’t want to see him in their services. Mikkelsen’s acting is superb. He uses “subtle control of his face and voice [to convey] the inner turmoil of a man who is being forced to feel guilty about a crime that never happened” (Roger Ebert). The film is distinctly actor focused. There appears to be little fuss about setting up shots and most everything is hand held. This keeps the film on a smaller scale. It pulls into the actors and really shows the emotions on their face. In a sense, this a great choice because the film is so incredibly character driven. On the other hand, it limits the narrative a bit and leaves much less symbolism and depth. Sure, a close up can convey the feeling of being “trapped,” but if most of the film is in close ups, the camera work gets stale. That is the only reason I gave this film four stars instead of five. Otherwise it is a complete knock out. I would recommend this film to almost anyone. Rest assured, you will feel a lot of emotions while viewing this film but I would really consider it worth your time. 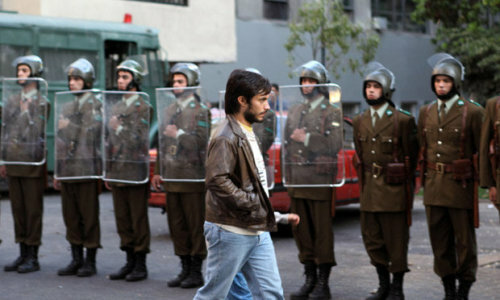 Nominated for Best Foreign Language Film (Pablo Larraín). No is an interesting contribution to this year’s foreign language films. In the beginning I was not a fan. It is a Chilean film about the 1988 referendum and the ad executives who produce the campaigns to defeat Augusto Pinochet. It is shot, produced, and directed as if it was all actually done in 1988, complete with 4:3 aspect ratio and obsessive lens flares that over expose the frame constantly. Perhaps the thing that took the most getting used to was the jump cuts. Jumps cuts are cuts used in editing. There is no transition between clips, but one clip right up against the next, often different locations and potentially different characters in each scene. Usually, in film editing, even if they use jump cuts they will insert clips to imply time has passed or that we have moved to a different place. In the beginning of No, the campaign is trying to talk René Saavedra (Gael García Bernal) into directing the TV spots, while his boss is trying to talk him out of it. With little to no back story or understanding of the Chilean political climate, we are thrown into these scenes edited back to back to back, often only a few seconds long. If the rest of the film was like the beginning, I might not have made it through. As an editor and lover of story, I could not be grabbed by the dialogue that I could not understand and the conversation that I could not keep up with simply because of the editing. Things turned around pretty quickly, however, and while they still employed the same type of editing throughout the film, it slowed down and eventually used some traditional timeline tactics and only occasionally used their chaotic use of jump cuts to better effect. The No campaign is granted fifteen minutes of airtime a day, while the Yes campaign receives the rest of the time. René spends much of his time convincing those around him that they need a jingle and a focus on happiness instead of the fear and hatred that they all feel in their hearts. General Pinochet has allowed the election mostly because of international pressure, and after his long time in office, he has instilled a lot of fear in his people of disappearances, exiles, and deaths. The No campaign is innovative, current, and employs a lot of commercial tactics from the west, including the Coca Cola versus Pepsi commercials that were airing at the time. They use a lot of humor and symbols associated with happiness. The Yes campaign eventually begins to adopt the same tactics. While there is a lot of fear and some vandalism, René and his associates stay relatively safe from political backlash. We follow the majority of the process, right up until the election. René is stoic and unemotional the majority of the time. He rides a skateboard which implies both that he is young but also that he is clinging to youth and innocence. Despite his differing views from his employer, his boss protects him and advises him against becoming tangled in the wrong side of politics. Once it is all said and done, they are both still on the same side–that of supporting each others’ artistry. There is a lot to love about No and one of those things is that they took the risk of not shooting everything in HD. It is old and gritty and dark. Some characters are quiet observers while others are passionate orators. There is family drama and love. If you are okay with reading subtitles and can make it through the first half hour, this is actually a pretty good film. It is straightforward and almost one-note, but perhaps that is the film’s strength. It does not try to throw in any plot twists, but carries you along with René to discover what it means to be a political activist in Chile in 1988.